This procedure must be performed after replacing wheels, transmitters or the BCM, or rotating wheels. Select вЂњStartвЂќ on вЂњID REGISTвЂќ screen. 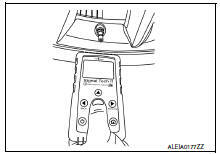 Hold the transmitter activation tool (J-45295-A) (1) against the side of the left front tire, near the valve stem. Repeat steps 4 and 5 for the remaining tires in this order: right front, right rear and left rear. When ID registration is complete, check the following pattern at each wheel. After the ID registration procedure for all wheels is complete, press вЂњEndвЂќ on the CONSULT to finish ID registration. Test drive the vehicle to ensure that the TPMS lamp is OFF and no warning messages are present. The Signal Tech II must be updated with software version 1.1.48 or newer in order to perform the below procedures. The Signal Tech II software updates can only be downloaded from a CONSULT unit with ASIST. Other versions of ASIST will not show the updates. Adjust the tire pressure for all tires to the recommended value. Refer to WT-54, "Tire Air Pressure". Turn on the Signal Tech II tool (J-50190). Hold the Signal Tech II against the side of the left front tire, near the valve stem. With the tool held at a 0 to 15 degree angle to the tire, select вЂњActivate SensorвЂќ from the main menu, then press and release the вЂњOKвЂќ button to activate the sensor. Once the sensor is activated, the vehicle parking lamps will flash and the sensor ID will appear on the CONSULT screen. Repeat steps 6 and 7 for the remaining tires in this order: right front, right rear and left rear. Once all sensors have been activated, select вЂњEndвЂќ on the CONSULT to finish ID registration. 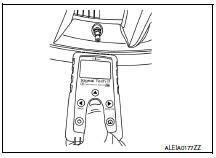 Turn on the Signal Tech II tool (J-50190) and select вЂњTPMS CheckвЂќ from the main menu. Select vehicle model and year. With the tool held at a 0 to 15 degree angle to the tire, press and release the вЂњOKвЂќ button to activate the sensor. Once the sensor is activated, the tool will sound a tone and the tire pressure will be displayed. If no DTC is present or the repair has been completed, press the вЂњOKвЂќ button to register the IDs and clear DTCs. Print a Signal Tech II Audit Report for your records. Refer to the Signal Tech II User Guide for instructions. Adjust the tire pressure for all wheels to match the list below. Drive the vehicle at a speed greater than 40 km/h (25 MPH) for 3 minutes or more. After ID registration for all wheels is complete, press вЂњEndвЂќ on the CONSULT to finish ID registration. Adjust the tire pressures for all tires to the recommended value. Refer to WT-54, "Tire Air Pressure".